Waek Arakji torched Mighty Sports with his scoring acts. MANILA—Mighty Sports came just short of completing a huge comeback and bowed to Al Riyadi, 89-84, in the knockout semifinals of the Dubai International Basketball Championship at the Shabab Al Ahli Club in Dubai early Saturday (Philippine Time). Despite the resilience of Justin Brownlee and Jeremiah Gray in the second half, Al Riyadi found a way to escape with the win thanks to clutch rebounding, especially in the offensive end. Brownlee actually struggled at the start of the game as Al Riyadi, led by guards Amir Saoud, Dominique Johnson, and Waek Arakji, looked to pummel Mighty Sports as early as the first quarter. But just as Brownlee began to pick up the pace, Mighty Sports slowly recovered and was within six, 20-26, at the end of the period. Johnson and Arakji then sparked a second quarter storm from three-point range that opened a double-digit lead for Al Riyadi. A late rally by Mighty Sports cut the lead down to 14, 54-40, at halftime. Frontliners Hayk Gyokchyan and Ismael Abdelmoneim then joined the rainbow party in the third as Al Riyadi posted its largest lead at 23, 63-40, with eight minute left in the period. Brownlee and Gray came alive later in the third, helping Mighty Sports cut the lead down to just nine, 76-67, at the end of the period. Mighty Sports started the fourth with five straight points as the came to within four, 72-76, with 7:50 remaining. But Johnson and Arakji converted huge baskets to stretch Al-Riyadi’s lead back to eight, 84-76, with 4:26 to go. Mighty Sports remained resilient especially on the defensive end, but huge offensive rebounds from Abdelmoneim, Gyokchyan, Chris Obekpa, and Jean Abdelnour kept Al Riyadi afloat until the end. 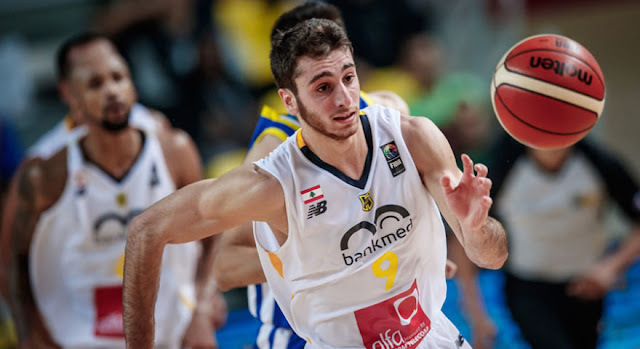 Arakji finished with 23 points, four rebounds, four assists, and one block for Al Riyadi, which will face Beirut Club in an all-Lebanese final later Saturday. Johnson added 22 points, one rebound, six assists, one steal, and one block. Abdelmoneim finished with a double-double of 10 points and 10 rebounds alongside three assists. Brownlee put up 24 points, five rebounds, four assists, four steals, and one block for Mighty Sports, which was relegated to a showdown with Homenetmen for third place. Morris, who picked up the pace late in the game, added 21 markers, four rebounds, and one steal.